Mike Overcast attempt to con people into donating through Baja Racing News.com, a well known B.S. website containing slanderous "reporting", 75% stolen content and images, 20% lies and 5% fantasy creations of "hoM.O." "Douchebag" Mike Overcast - other aka's used and titles given include - "Gary Newsome", "Cabo 500", "Speed Mex", "Janice Gilmore", "Hollister", "andymeyer", "Garner racing", "aj racing", "Baja Brad" "pusseebtch"
Mike Overcast is well known within the off-road society for his fraudulent and money extortion activities. A very simple Google search for Mike Overcast + Offroad like you find when clicking this link give you more feedback on this highly questionable individual. 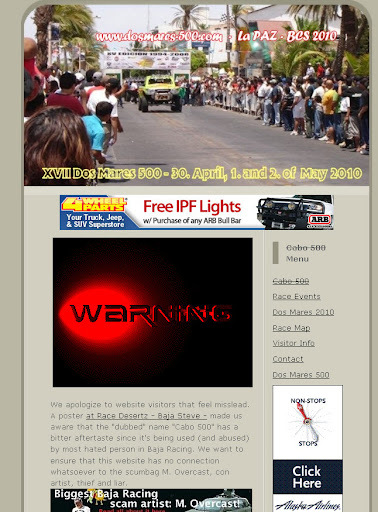 Declared as "Baja #1 enemy" by the mexican Ensenada newspaper, elvigia.net and other publications from Baja conman Mike Overcast continues to "promote" races and race series using events that are, to our knowledge, in no relation with that guy. Cabo 500 for example. He was involved with that race 5 years ago - we understand there been many "mysteries" on the price money for racers at the time of his involvement is a race official called Dos mares 500 and run by a La Paz organizer that claims to have no involvement with Overcast. Cabo 1000, another phantasm of Mike Overcast / bajaracingnews.com used to con $ of people. The race is called "Grand Baja Sur" and organized by a Loscabos organizer that also claims to have NO involvement with Mike overcast and his slanderous publication.